In October when I was in Florida, my sis and her husband took my husband and me to a Farm Bureau dinner. They are big proponents of buying local, so they searched for whatever kinds of insurance that they could find, locally. For them, that means a local business called Farm Bureau insurance. The Farm Bureau had a big dinner - a bbq - as in “southern bbq” - meaning tomato sauce slathered on meat (sigh) - not meaning hamburgers and hotdogs (!!) on a grill - and we went along - and yes, I was disappointed - I really prefer hamburgers and/or hotdogs to meat covered in bbq sauce = but I wasn’t there primarily for the meal - it was something to do with my sis and her husband. It’s a yearly shindig at our local fairgrounds (! It’s a BIG deal!) in order to get the members of this farm bureau to come to their meetings so they could vote on things. I guess it is a member owned type of insurance company. As part of the meeting, they had a bunch of door prizes. We like door prizes. When we sat down my sis told the ladies next to us that they would probably win something since it seems like every year the people next to them win something, but they don’t! Sure enough—that lady won something! Yes, she did! I’m not kidding! But that’s not really the point of this post. We noticed that the people who donated door prizes got quite a bit of attention of the the whole group - about 600-800 citizens of our town - including many business owners. I asked if it would be possible to get together a prize of a quilt- maybe a queen size quilt set - a quilt and a couple of pillows like I did for the wedding quilt last summer. My sis went to see the Farm Bureau in the next couple of days and they were quite happy about it. My sis hadn’t been sure if in order to donate a prize you had to be contacted individually and asked. But that’s now how it works. They said they would be quite happy to use something like a quilt as a door prize - the only requirement was that it had to be farm themed. I thought, well, that shouldn’t be too hard. My sis has a whole row of farm themed fabric. At first we thought I could whip up a couple of twin sized ones using John Deere panels, but I still wanted to make a larger one that wasn’t John Deere. I realize that nothing will be universally liked, but some things have greater appeal than others while still being farm themed. As I was thinking about the pattern, I thought, well, it needs to be simple enough to enjoy. 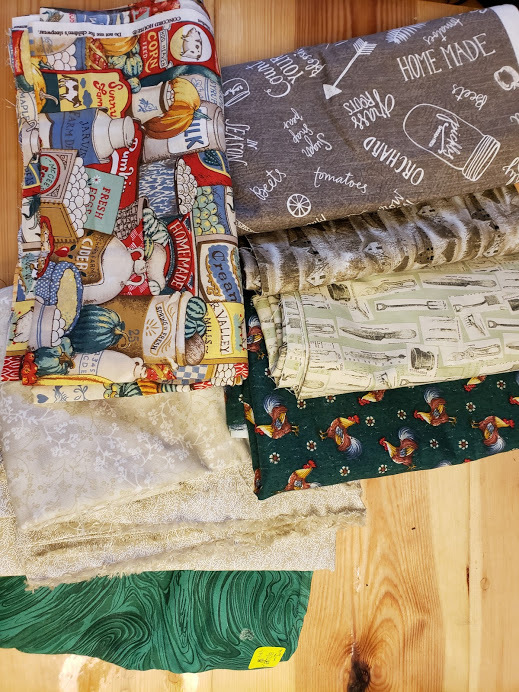 Obviously if it has to be farm themed, I can’t cut the pieces infinitesimal and expect people to like it since they won’t even be able to see what the design is if they are as small as many typical scrappy quilts. So, I opted for larger pieces - at least some of them. I’ll have to show the whole top when I am finished and get pictures. Here’s enough to whet your appetite. I found these produce type pieces in the store. However, it appears like she is out of them - maybe she’ll get it back in stock. 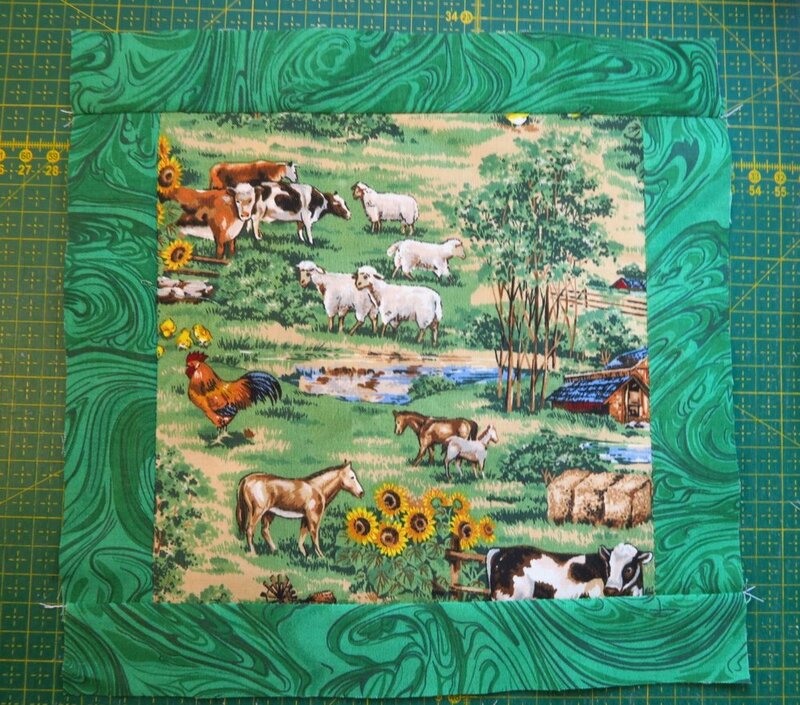 I found this farm themed fabric in my own stash once I got back to Poland- and I thought I’d use it. Here’s a tiny peek of what I’m up to. And of course, I love words fabric. I’ve not actually used that many of them, though, but this was the perfect chance for me to do so! I have collected more of them than I have actually used them! (I’m going to see about changing that, though!) At this writing, my sis is out of this adorable fabric by Wilmington Prints, but she may get some more in stock. I thought this words fabric went with it as well, so I took 2 yards of it from the store. I thought this fabric was interesting as well, and shows all kinds of gardening tools. I thought it quite appropriate for a farm themed quilt. You can get yours here if you are so inclined. And that’s what I’m doing these days! When I finish the top, I’ll work on some pillows - probably throw pillows since I’m making this one big enough to have a pillow tuck. I may incorporate some pillow cases, however! We’ll see how ambitious I’m feeling. I’ve not felt 100% the last couple of days. It feels like I’m fighting a cold - on top of going through multiple time zones, and having company - I’ve been working at a snail’s pace, it feels like anyway! Nah, not really. While it’s true that I’ve not felt my best, I think I’m starting to get back in the swing of life here in Poland. I find it harder as I grow older to hop back in. Travel IMO, is for the young! Anyway - that’s what I’m working on!